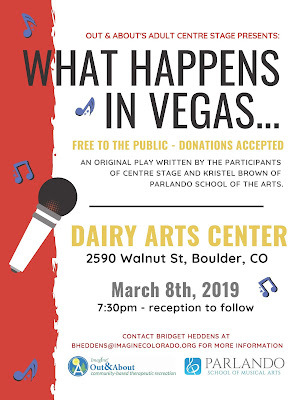 Imagine!’s latest Out & About Centre Stage performance is scheduled for March 8 at the Dairy Arts Center. Learn more about Centre Stage here, and please join us next Friday for what is sure to be an amazing event. By the way – Imagine!’s Out & About Center Stage program is selling t-shirts this year. This fundraiser will help support our mission of bringing the arts into the lives of individuals with disabilities. Click here and buy your shirt today!